B0985. Raffaelle de Rensis. 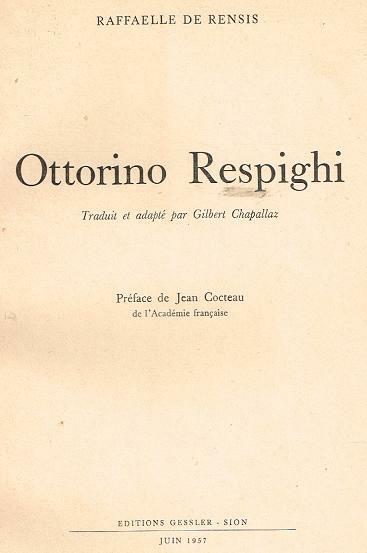 Otto Respighi (traduit et adapté par Gilbert Chapallaz; préface de Jean Cocteau). Sion, Éditions Gessler, 1957. 99pp. Chronology; List of Works; Discography; Photos. (French Text) Softbound. Choice copy, Half-Title-Page of which is inscribed & signed by Chapallaz. “Raffaele De Rensis obtained a law degree to follow the family tradition, soon decided to give up the legal career to devote himself to literary studies and musicology. A student of Giovanni Gentile, in 1898 he founded the newspaper in Campobasso, dedicated to poetry and literary criticism in which also collaborated with Vittorio Gui, Gian Francesco Malipiero and Pizzetti. Also in 1898, participated in the creation of the Association of Italian musicologists, of which he was the first secretary. In 1909 he was among the founders of the Association for contemporary music in which he began his music criticism. In the latter capacity from 1905 to 1925 he worked with ‘The Messenger’, then with ‘The newspaper 'Italy', until 1934. Also active as a musicologist and lecturer, in 1935 he held a series of conferences in Germany on behalf of the Dante Alighieri Society and is editor of talks with Italian Radio (EIAR). In 1938 he developed the Italian Institute for the history of music, with the goal of ‘increasing musical culture through publications of important new or rare works’. He also stood as a fine and fascinating popularizer of the musical heritage of all time. De Rensis maintained correspondence with the most important musical personalities of his time, including Pizzetti, Mascagni, Strauss and Wolf Ferrari.